Archaeologists believe that the first wheeled vehicle was invented about 5,500 years ago. It was about an hour later that racing was invented. Well, that’s just a guess on my part, but there’s no denying that “let’s see how fast this thing will go” is a human passion that has been around a long time. The ancient Romans had a track called Circus Maximus where chariot races took place; it could be argued that its modern-day equivalent is in Indianapolis, Indiana. The title of this post is the slogan of the Indianapolis 500 auto race, and it is not an idle boast. Over 300,000 people pack the Indianapolis Motor Speedway every year on Memorial Day weekend to watch very loud cars go very fast on a very large oval. This year is the 100th anniversary of the Indy 500. 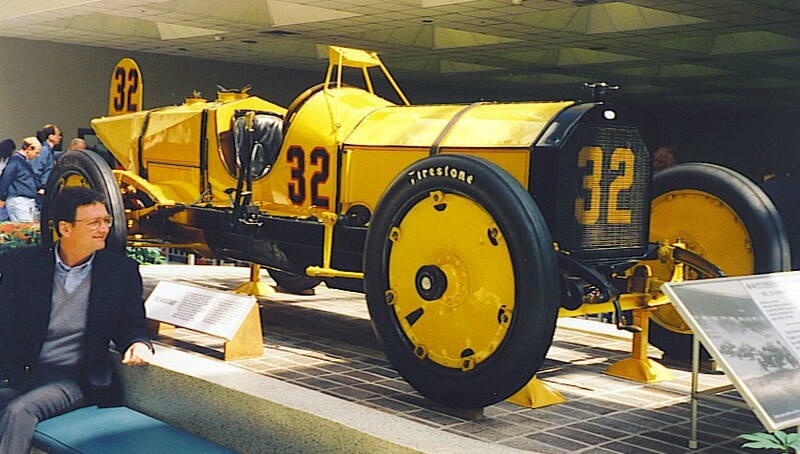 The inaugural 500-mile race was won by Ray Harroun, who drove a car known as the Marmon Wasp (see photo). Harroun’s average speed was 74.602 miles per hour, considerably slower than that guy in the pickup truck who forced you off the road yesterday. We look back at 74 mph and think, “that’s cute” — but when you put it in historical context, it’s scary fast. Think about it: in 1911, there were still Americans who had never even seen an automobile, much less driven one. The Ford Motor Company had been producing Model Ts for 3 years. That car had a top speed of 40-45 mph, and certainly wasn’t capable of sustaining that pace for 500 miles. Still, the contrast between that first Indy 500 and more recent ones is “wow”-inspiring. The fastest average speed for the entire race was 185.981 mph, a mark set in 1990 by Arie Luyendyk. He is also tied with Emerson Fittipaldi for the fastest single-lap speed ever. In that same 1990 race, they both burned a lap at 222.574 mph. To help you comprehend how fast that is, typical takeoff speed for jet airliners is in the range of 150-180 miles per hour. Officials have changed the specifications for the cars in the last couple of decades, which has resulted in relatively slower (and safer) speeds. In 2010, Dario Franchitti won the Indy 500 with an average speed of “only” 161.623 mph. Franchitti collected winnings of $2,752,055 that day; back in 1911, Ray Harroun’s purse was $14,250. Although the 2½ mile oval at Indianapolis has been covered with asphalt for many years and subsequently smoothed with modern-day materials, there is still a yard of bricks at the Brickyard: a 3-foot strip of bricks has been retained at the start/finish line. In honor of this year’s centennial, a gold brick has been placed in that strip. If you have any thoughts of running out on the track and trying to pry that gold brick loose, forget it — there will be a lot of cars headed your way, and they will be going ridiculously fast. This entry was posted in Sports and tagged Indy 500. Bookmark the permalink. I’m less intersted in the races and more interested in the accompanying parties. A work colleague recently told me about “Speed Week” in Charlotte, North Carolina – a four-day street festival before NASCAR’s Coca Cola 600. It’s been added to my “to do” list, along with being in the infield at the Kentucky Derby. There is a lot of partying associated with the Indy 500, too, particularly in a section of the infield that is called The Snake Pit. As the name suggests, this has been the area where fans get really drunk, act stupid, and expose body parts. In other words, they behave like politicians. It should be noted that there are other areas at the Brickyard where the partying is more focused on having fun than on accumulating regrets.